The next Assassin’s Creed is going to turn heads. That won’t just be because it’s set in ancient Greece, nor simply because it lets you play as a man or a woman. It’s also changing the series’ combat yet again, offering more options for stealth, and even fleshing out the modern-day stuff that’s been lacking in recent games in the series. This is the most ancient AC game, from the team that made the most modern one. The main studio behind Odyssey is Ubisoft Quebec, which previously led development of 2015’s Assassin’s Creed Syndicate. That game primarily took place in England during the Industrial Revolution and was therefore the most modern of the AC games. Odyssey, set primarily in and around 431 BC during the Peloponnesian War, is the furthest back, some four centuries earlier than 2017’s Origins, which took place in Egypt just before the turn of the millennium. Odyssey’s action is set before the founding of the assassins’ brotherhood, though AC buffs will recall that there were some assassins, like the Persian Darius cited in Assassin’s Creed II, who precede Odyssey (Darius is right before it). It’s going to be more of an RPG than ever. Odyssey creative director Jonathan Dumont says the new game “is pushing our franchise into full RPG.” He might as well have said it’s going full BioWare, as Odyssey is bringing several role-playing game stand-bys familiar in that studio’s RPGs into Assassin’s Creed for the first time. Those include: a multiple choice dialogue system, branching quests, multiple possible endings and even the ability to romance several characters. Narrative director Mel MacCoubrey has worked on AC games since Freedom Cry and creative director Jonathan Dumont was world director on Syndicate and spent several years before that designing World of Warcraft games. The character choice is for looks and won’t affect gameplay or story. 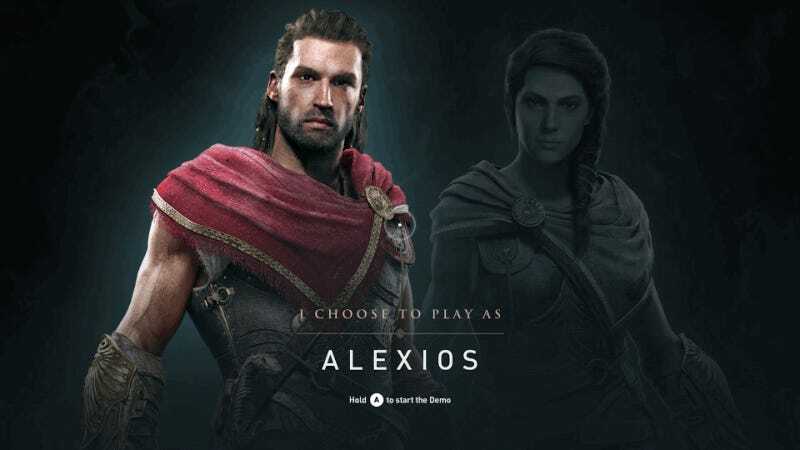 Near the start of the game, players decide to play as either Alexios or Kassandra, a man or a woman. Playing as a woman in AC isn’t new. People could do that in 2012’s Liberation and in parts of Syndicate and Origins. Choosing which character to play as, however, is new. Dumont chalked it up to wanting to give players as much choice as possible and said it won’t affect how the game plays or wraps up. “The stories are similar,” Dumont said. “You don’t have many changes. The acting is a little different because the actors give it their own sauce. It’s much more a vehicle for how you want to roleplay with these characters.” There are no gameplay-specific differences and even the characters who are available to romance are the same regardless of who you choose. “You do you, man,” narrative director Mel MacCoubrey told me. They’re all-in on the modern day and First Civilization stuff this time. At events like these, Assassin’s Creed developers seldom say a word about the modern day aspect of upcoming games in the series. That’s to the relief of the large part of the fanbase that isn’t into that stuff, and to the frustration of those of us who love it and have lately been disappointed by how slender recent offerings have been. To my delight, Dumont happily explained the set-up for the modern part of the game. Even more exciting for us weirdos who like the deep lore might be the extent to which the Odyssey developers are promising connections to the mysterious First Civilization, the barely-seen progenitors to the series’ Assassin-Templar conflict. There’s a narrative explanation for the option to choose your character. The initial conceit of Assassin’s Creed games was that a person in the modern day used a device called the Animus to live through the memories of one of their ancestors. That was clever, and it’s a minor shame that Ubisoft wasn’t able to stick to that concept which helped the series feel so distinct. Last year’s Origins showed a way around it. Layla can use a modified animus that enables her to experience the memories of people she’s not related to. In Odyssey’s case, Dumont said, there are “two possible matches for DNA” for the person whose life she is trying to experience, which is the explanation for why players can choose who they control. Hey, at least they have an explanation! The game world is enormous and geographically diverse. Dumont described the game as the biggest one yet for the AC series. That’s got to be qualified by the fact that a lot of it is set on water. The game world is full of various biomes, presenting players with everything from snow-capped mountains to forests to beaches. Chunks of the game are considered by the developers to be “regional content” that functions outside of the main story and presents contained narratives and adventures for players to experience. The bright area on the rightis the region that is available in the game’s E3 demo. The game’s producer ballparked the size of that one area as being roughly equivalent to that of the entire playable area of Assassin’s Creed Brotherhood. You have a bird again. Odyssey uses enough of Origins’ graphical tech and iconography that it might be seen as a re-skin of last year’s ancient Egypt epic. Origins players will recognize a lot of the same interface and gameplay options including the returning radial compass that replaced the franchise’s old mini-map and even the return of a drone-like bird who can survey the landscape, spot treasure, and highlight and harass enemies. The bird is called Ikaros in this one. Building on a recent game is not necessarily a bad thing. Some of the best-regarded AC games, including II, Rogue, and Syndicate all were relatively light on technological innovation and were instead strong on gameplay improvement and creative world-building. Most of what Origins discarded is still gone. Old gameplay tropes like climbing towers to defog the map remain abandoned, as they were in Origins. Social stealth (blending in with crowds) isn’t back either. There are still eagle dives, of course. I did one from the top of a boat into the sea. Anyone else remember when you couldn’t swim in these games? 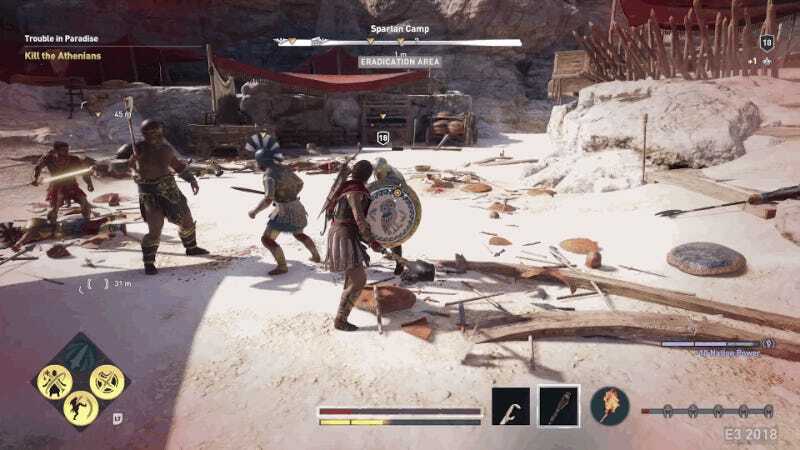 Odyssey explicitly quantifies the player’s prowess in three styles of play: ranged fighting (Hunter), close-up brawling (Warrior) and stealth (Assassin). Character outfits will be far more customizable. Despite surface similarities, there are heaps of tweaks to the Origins formula evident even in Odyssey’s E3 demo. The loot system returns, for example, but instead of one category for wearable gear there are five. Gear is classified by rarity. Each piece of gear can be enhanced with engravings that might increase critical hit damage or fire damage, for example. The skill tree and the way abilities are triggered have both been been adjusted as well. Some skills are are common to any play style. That includes things like calling for your horse or bird, changing the game from day to night (a neat feature returning from Origins) or knocking out and recruiting enemies (more on that later). As with Origins, the skill tree branches to offer new moves that cater toward ranged combat, close swordplay or stealth. Several baseline skills are given to all players, but players then pick more skills from the hunter, warrior or assassin trees. In this screenshot, the warrior branch is hidden behind a pop-up that shows a stealth ability that can be upgraded after it is unlocked. The combat system from Origins has been given a major twist. Combat is still based on hitboxes, requiring players to focus on well-timed attacks that happen at an effective range. New, however, is the option to map four or more moves to the face buttons and then trigger those moves as the player builds up their adrenaline meter. As I played the demo, this appeared to help diversify my arsenal and remedy the lack of available moves that held Origins’ combat back from being as enjoyable as, say, God of War’s. In the midst of a battle, a player who has, say, a Spartan Kick and a shield-grab mapped to the face buttons can do regular attacks, build adrenaline, and then press left bumper (or L1) to unleash a kick or to grab the enemy’s shield and throw it at them. I tried that. It was fun. Players who favor stealth or ranged play can map adrenaline moves tied to those skill branches and unleash moves of those types instead. That was cool, too. The shield grab costs a notch of adrenaline as it is spent with a button press. They’re improving stealth. Stealth was an option in AC Origins, but not a great one. 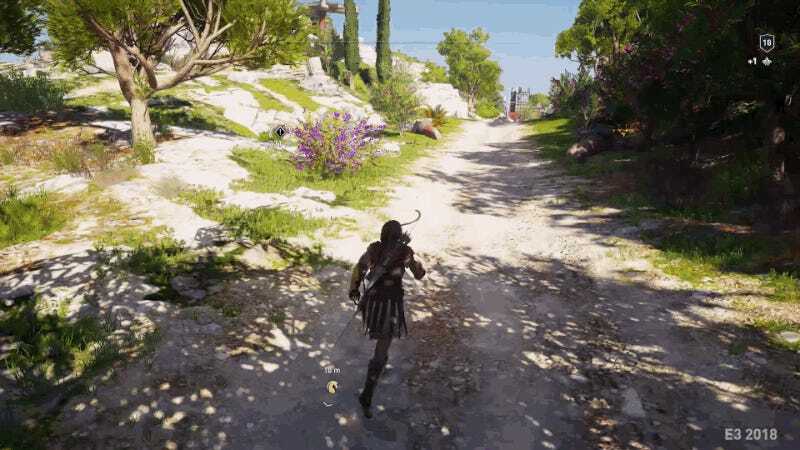 That game’s lead protagonist, Bayek, couldn’t reliably assassinate high-level enemies with his hidden blade, and players were generally not incentivized to clear enemy bases without raising alarms. Dumont said they’ve tweaked the experience points payout for stealthy play in Odyssey, giving players more for stealth kills, on the assumption that the time spent to get one stealth kill might be the same as running in and loudly chopping through a few enemies. Leonidas’ spear, taking the place of the hidden blade, will be good for a one-hit stealth assassination of enemies the same level as the player or one level above, according to Dumont. The stealth part of the skill tree also displays a wider array of stealth moves, including the option to send recruited allies in to cause distractions and a move that lets you rush up onto an enemy to stealth-kill from range and then even chain in a second kill. The boat is a big part of the game. Odyssey won’t just give AC players flashbacks to Origins. It’s also a callback to the water-based adventures of Assassin’s Creed IV: Black Flag and AC: Rogue. 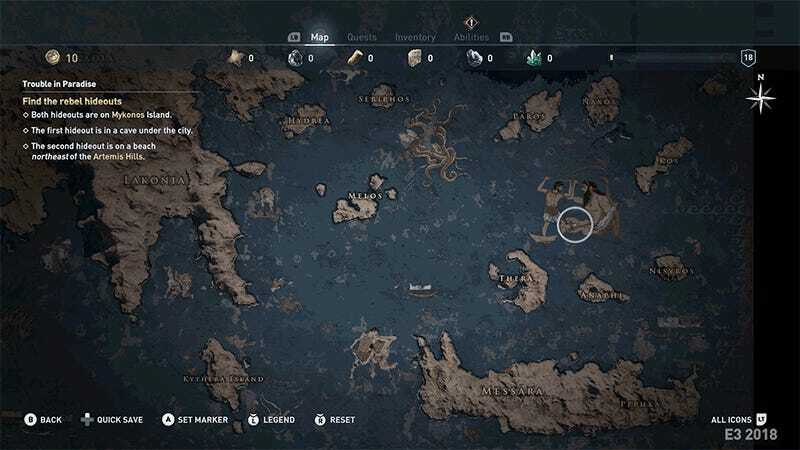 Odyssey offers players a huge world that has a lot of water in it. Players can sail the Aegean sea, hopping from one Greek island to the next, while engaging in naval combat against enemy ships. There may be other sea-based gameplay activities, since a trailer for the game showed one of the characters doing what looked like a deep dive. But all that was shown in the E3 demo were familiar naval skirmishes, complete with the ability to ram boats, order the crew to fire arrows or spears and board disabled ships. Most characters in the game can join your ship’s crew. The player’s ship is called the Adrestia, it sounds like it might double as their de facto HQ. Most of the game’s enemy combatants and even many of its civilians can be recruited to become part of the ship’s crew (or to serve as distractions on land for stealth-oriented players). Those recruitable followers will offer stat bonuses and perks, some of which will be visible by your bird as it scouts the areas of the game’s landmasses that you explore. According to the Odyssey developer who watched us play the game’s E3 demo, players will be able to customize the ship’s look, down to the gear the crew wears. Odyssey’s massive world will be influenced by a systemic power system that players can manipulate. The game’s version of Greece is divided into 27 states, each with their own leader. A red-vs-blue divide will show which areas are under the influence of Sparta or Athens, respectively. “When those leaders get in trouble and their resources go down, they become weak,” Dumont said. “And other factions will invade their state.” It’s not clear if this happens automatically over time or if these changes in power are solely affected by players. Leaders who are in trouble will offer contracts to get help, and the player, who is technically controlling a mercenary, can choose to take on those contracts, Dumont said. Players will also be charged with taking down some regional leaders and be shown a meter that displays how tight a grip the leader has on their state. Looting and destroying things in the leader’s region will make the leader an easier target, a system that seems to build on ideas offered in everything from the first Crackdown to this year’s Far Cry 5. This regional map shows several locations of interest. It also has some information about a regional mercenary called the Beast. More importantly, a purple meter on the right shows the power of the region’s leader. Certain actions in the region deplete the meter, supposedly making the leader an easier target. Players may also find themselves the target of mercenaries as bounties are put on their heads for various actions. The demo’s map showed indicators for rival mercenaries and for the people who hire those mercenaries, suggesting you can interact not just with people hunting you but those paying them. If the player kills civilians, Dumont said, they can expect to find a bounty on their head. You can get hunted on the sea by other ships as well. There will be epic land battles. One of Odyssey’s additions to the franchise are large-scale battles featuring as many as 300 (ahem) brawling combatants. Some of these battles will be part of the game’s main storyline, others optional for players who wish to focus on them. Dumont described them as a test of players’ combat skills. As players fight in them, they’ll be given sub-goals to target specific characters, such as a special enemy who might pop up. Dumont said that players who enter the battles with a bounty on their head will see mercenaries on the other side. He also warned of the appearance of formidable foes, such as Achilles. You can lie to people. The developers say their game will be as faithful to history as possible, but within that, they’re exploring ways for players to experience a malleable narrative. Narrative director MacCoubrey said there are some 30 hours of interactive storytelling in the game and that players can interact with other characters in as many as 13 ways, not all of which will be presented in a given chat. Examples of such interactions might be lying or flirting or being aggressive, ideally with unpredictable outcomes. A romance dialogue option appears. See the heart next to one of the lines the player can choose? Kassandra has just made a crack about Thaletas’ speech. He’s pridefully shot back that he gives orders, not speeches. She (and the player) get a chance to flirt over that. You can flirt. Romance options in Odyssey are also meant to be morally complex. MacCoubrey said she doesn’t want them or any other relationship in the game to be a simple matter of giving characters something and reaping a reward. She wants players to feel like they’re getting to know characters who live in a specific context and she wants to be sure that it doesn’t feel like all of the world, including all of our heroes’ possible flings, revolves around the player’s character. 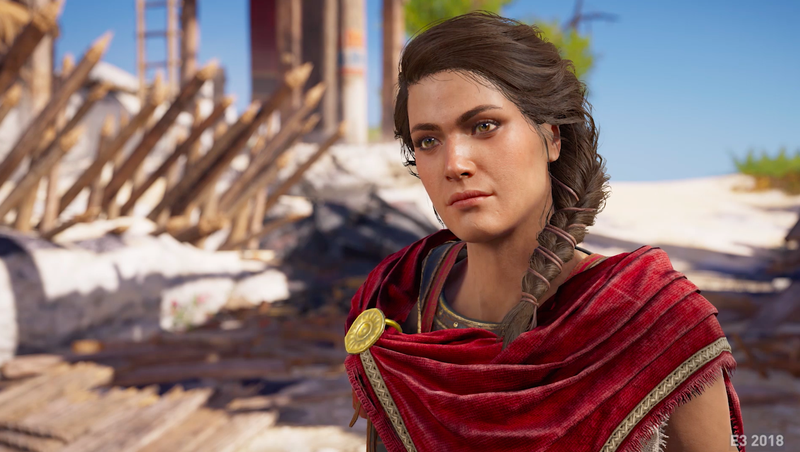 There’s one major romance option in the demo, in which the player, as Alexios or Kassandra, can try to romance the rebel Kira or a warrior she’s been warming to named Thaletas. In the demo’s Socrates quest, the philosopher describes a not-quite hypothetical scenario involving a rebel who stole for a good cause but killed a guard in the process. The player can argue who is right or wrong. Then they can try to rescue the man and debate Socrates some more. Dialogue may be malleable to suit the action. Socrates commented on a guard I’d killed during the mission. He wouldn’t have said that, a developer told me, if I hadn’t killed anyone. I’m not sure if Zeus is going to show up. Assassin’s Creed Origins had some unadvertised supernatural battles, as well as a massive expansion that included some quite prominently advertised fantasy elements. Throughout their presentation of Odyssey, the game’s developers referred to Greek myths and gods, but nothing they’ve shown or mentioned indicates that players will encounter them, let alone battle them. The developers are being cagey here. On the one hand, they’re suggesting that they’ll explore the roots of myths. For example, Dumont shared the idea that a man with an eyepatch might beat a second man up. That second man might tell this story to his wife, who might retell it to someone else, and within a thousand years that’s the story of a sheep-eating cyclops. Dumont also suggested that the seemingly supernatural aspects of the First Civilization could give the developers things to explore. I don’t know. If Kratos isn’t fighting Greek gods anymore, I’m betting these AC heroes will find a way. And, actually, the game’s E3 gameplay trailer sure ends with what looks like a minotaur showing up. And there’s more? Well, of course there is. This is a preview of an Assassin’s Creed game, and a Kotaku preview of an Assassin’s Creed game at that. Wouldn’t want to leave you all disappointed. Let’s do the lightning round. Like just about every other major Ubisoft game, Odyssey is not a one-studio operation. Ubsoft Quebec is the lead studio, but over e-mail, a Ubisoft rep provided this supplemental list of nine other studios as well: Ubisoft Montreal, Montpellier, Kiev, Bucharest, Shanghai, Pune, and Singapore studios / Sperasoft / Technicolor Games. Assassin’s Creed Origins’ wonderful papyrus quests, which presented players with clues about treasures hidden in exotic parts of the game’s massive map, will return in the form of “Ainigmata Ostraka.” There’s at least one to be found in the game’s E3 demo, but the developer watching me play said the reward for it was deactivated so as to avoid spoiling something. Hmmm. No indication of multiplayer. When asked, Dumont said players should think of Odyssey’s online offering to at least be the same as Origins’, and that it’ll be treated as a live game with post-release updates. The guy spent several years working on World of Warcraft at Blizzard, for whatever that’s worth. The game will have a photo mode. There are sharks. And they might eat you (or your enemies). There are also “legendary animals” to hunt. I got mauled by a legendary bear. Odyssey is set centuries before Origins’ Bayek and Aya had their adventures, which of course raises the question of if/how the game could connect to the Egyptian adventures players saw in the most recent game. “Maybe in the future at one point we might communicate on different things after that,” Dumont said, stumbling through an answer. We laughed a bit.“Realistically,” he said gathering himself, “at the heart is a continuation of Layla’s story, that’s our hook for the continuation.” Here is where I should probably vow to eat something inedible if Aya and Bayek don’t somehow find a way into Odyssey.